So what is Edge of Darkness? It’s exactly what you think it is from the trailer. 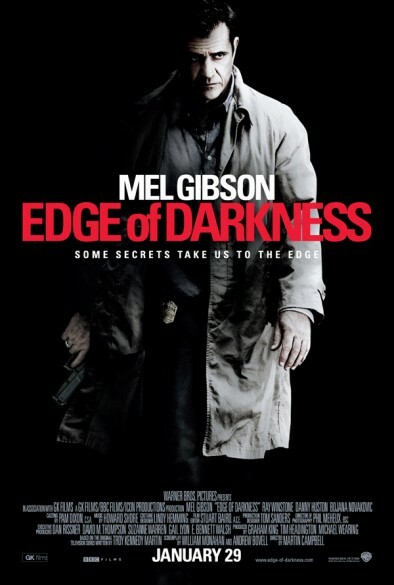 It’s Mel Gibson getting revenge for his slain daughter. Mel Gibson plays Tom Craven a Boston Detective welcoming home his daughter Emma. After noticing his daughter is sick, he then starts to take her to the hospital. At the door she is shot and dies in his arms in the doorway of his home. While grieving he takes on the case of solving her murder, since the authorities believe the killer meant to get him. This journey brings him in conflict with an evil government contractor and a senator. He also befriends an eccentric british spook that enjoys drinking and cigars. This movie breaks no new ground in plot or film making but it is a decent movie. The shots in this don’t move around they are set in place. After finding out this was a British television show, the look and feel of it is very much like that. At times I felt I was watching Mystery on PBS just with Boston accents instead of British. One thing though at times Mel sounds like Popeye the Sailor Man when he talks. It took me out at parts. The parts of the film where he is seeing or hearing his daughter works well. You can tell pretty much where the plot is going but the action parts are still exciting and fun even with Mel looking pretty gruff and old now. I give it a 2.5 stars out of 4, but I still think you should check it out. It is a very entertaining time at the theater (or couch if you wait for DVD). This time Jack Hatred and Julian Lytle talk about film remakes and the effect CG has on movies. Oh and Jack hates fans.